The homemade VSC/ SAO "North Star" Wooden Field Tripod. 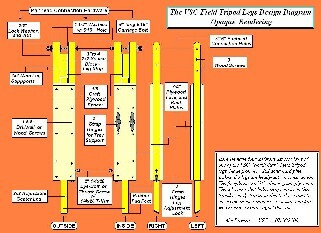 Main construction of the tripod prototype was completed on July 03, 2008. Welcome fellow Amateur Astronomers to the construction pages of the VSC "North Star" Field Tripod. When Gary Barabino gave me the bad news regarding the accidental destruction of his 8" Konusky's tripod, I began thinking about how to construct a new cost effective unit for him. The first parts I considered were the legs. Being the main support components of the tripod, they had to be strong with little to no flexure. Keeping cost in mind, I decided to work in wood. In deciding which type of wood to use, a number of species came to mind; oak, maple, walnut, etc. Then it hit me like a ton of bricks! During the construction of my 10" fork mounted Newtonian reflector, I used 2x2 hard pine stakes under the base platform to reduce flexure. Despite being made of pine, the stakes possess a hard durable grain that resisted bending and flexing. An added bonus was the fact they were very cost effective as compared to more exotic woods like the ones I mentioned previously. Each stake cost only $1.20, and I required nine of them to do the job, which totaled $11.55 including tax. If it were not for the inexpensive cost of these sections of wood, it would probably be better to just purchase a tripod from a major manufacturer. Along with the purchase of a half sheet of 3/4" plywood and various hardware components, we were able to construct this tripod that is superior in quality to many on the market today. This is indeed an awesome field tripod that any do-it-yourselfer can build using common household power tools, and a little patience.